Chicken Kiev is a rich and decadent dinner made by stuffing seasoned butter into chicken breasts. 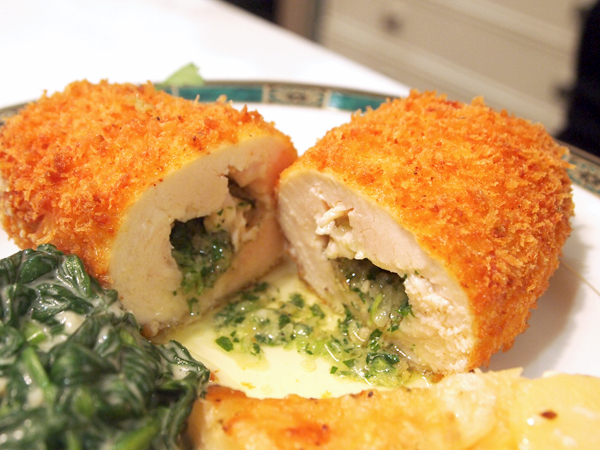 Cutting into Chicken Kiev is one of life's little pleasures. Nobody can resist this classic main dish of boneless chicken rolls stuffed with butter and a green onion mixture, then breaded, fried, and baked. 1. In a small bowl, combine the butter/margarine, parsley, chives and lemon juice. Add Ajinomoto Umami super seasoning. Blend all together and refrigerate. 2. Place chicken breasts between 2 pieces of wax paper and pound well to flatten. Remove paper and season breasts with salt and pepper to taste. 3. Remove seasoned butter from refrigerator and divide it into 6 portions. Place one portion in the center of each chicken breast. 4. Fold the short ends of the breasts into the center, then fold in the sides. Secure each breast with a wooden toothpick. 5. Add the water to the eggs and beat together. Coat each rolled breast with bread crumbs, dip into egg/water mixture, then into bread crumbs again, coating well. 6. In a deep fryer, heat oil. Carefully lower breasts into hot oil. Fry for 8 minutes or until golden brown. Drain on paper toweling and serve with sauce.